This little dinghy, just finished this afternoon, on the River Blackwater at Heybridge Basin. 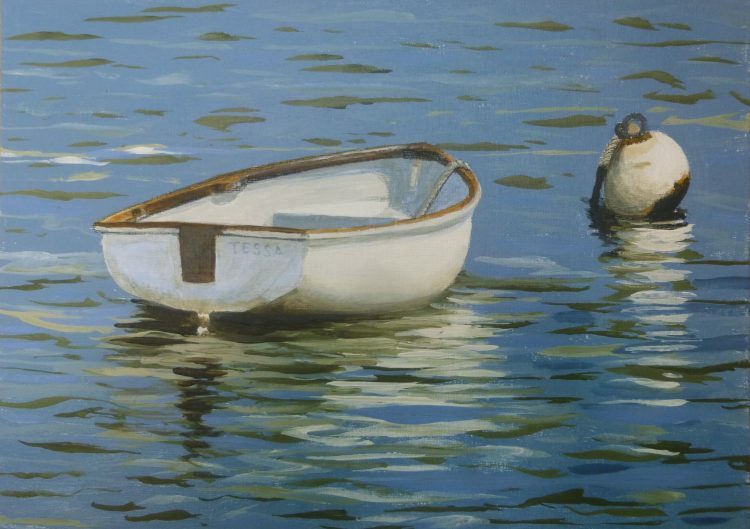 “Tessa” will be going along with Blackwater Dinghy on the Flowing Tide, and two Fingringhoe Wick series landscapes to the Geedon Gallery’s autumn exhibition, which starts on 7th October. The Sentinel Gallery: Yesterday Graham and I went to meet Debra, who, along with her partner James, now owns the Sentinel Gallery in Wivenhoe since the retirement of Pru Green. James and Debra are hiring out the gallery, and we went to have a preliminary look to see what changes had been made since Pru left. In fact, apart from the change in the wall colour in the gallery from white to blue and pale grey, and the absence of ceramics in the portion of the gallery to the right of the front door – it is exactly the same. So – BIG news here!! – I am booking it for a week in October 2019. I already have one of my artist friends, Caroline Sullivan, definitely wanting to show with me. The choice of others will take some mulling over, but I aim to have perhaps five of us involved. The exact dates and details have all got to be finalised yet, but it is an exciting new venture for us and we’re very excited about it.